Caratteristiche: Questo è il vino di cui sognava il Minnesänger. Il Traminer aromatico è conosciuto dall'anno 1000, Oswald von Wolkenstein lo ricordava spesso sul Lago di Costanza ("...sovente il mio pensiero corre a Termeno"). I nostri vitigni Traminer aromatico hanno 30 anni e nel 2002 abbiamo ottenuto un vino degno della grande tradizione. DEGUSTatene un bicchiere. Colore giallo dorato tendente all'ottone. Profumo di rose, con punte di lavanda e un sentore di marzapane e frutta secca. Sapore opulento, quasi pomposo nella sua costituzione, morbido e vellutato al palato, aromatico. "Falstaff Magazin" has rated the wine "Brunnenhof Mazzon Gewurztraminer Alto Adige - Sudtirol, Trentino-Alto Adige, Italy" from the vintage 2015 on 06.07.2016 with 87 of 100 points. "Vinous Antonio Galloni" has rated the wine "Brunnenhof Mazzon Gewurztraminer Alto Adige - Sudtirol, Trentino-Alto Adige, Italy" from the vintage 2013 on 01.05.2016 with 88 of 100 points. "Falstaff Magazin" has rated the wine "Brunnenhof Mazzon Gewurztraminer Alto Adige - Sudtirol, Trentino-Alto Adige, Italy" from the vintage 2014 on 23.06.2015 with 88 of 100 points. "Falstaff Magazin" has rated the wine "Brunnenhof Mazzon Gewurztraminer Alto Adige - Sudtirol, Trentino-Alto Adige, Italy" from the vintage 2013 on 24.06.2014 with 88 of 100 points. "Vinous Antonio Galloni" has rated the wine "Brunnenhof Mazzon Gewurztraminer Alto Adige - Sudtirol, Trentino-Alto Adige, Italy" from the vintage 2010 on 01.02.2011 with 92 of 100 points. "Vinous Antonio Galloni" has rated the wine "Brunnenhof Mazzon Gewurztraminer Alto Adige - Sudtirol, Trentino-Alto Adige, Italy" from the vintage 2008 on 01.10.2009 with 90 of 100 points. "Stephen Tanzer" has rated the wine "Brunnenhof Mazzon Gewurztraminer Alto Adige - Sudtirol, Trentino-Alto Adige, Italy" from the vintage 2006 with 90 of 100 points. 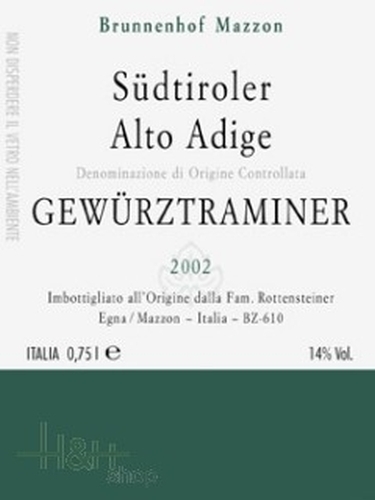 "Stephen Tanzer" has rated the wine "Brunnenhof Mazzon Gewurztraminer Alto Adige - Sudtirol, Trentino-Alto Adige, Italy" from the vintage 2005 with 88 of 100 points.